It was big and burly, but don’t call this Triassic-era beast a dinosaur. More closely related to mammals, this oversized herbivore is rocking the palaeontological world—and changing what we know of evolutionary history. The incredible creature, named Lisowicia bojani, was a dicynodont—a distant cousin of mammals. Remarkably, it lived 237 million years ago during the Triassic—the first of three periods to host the dinosaurs. 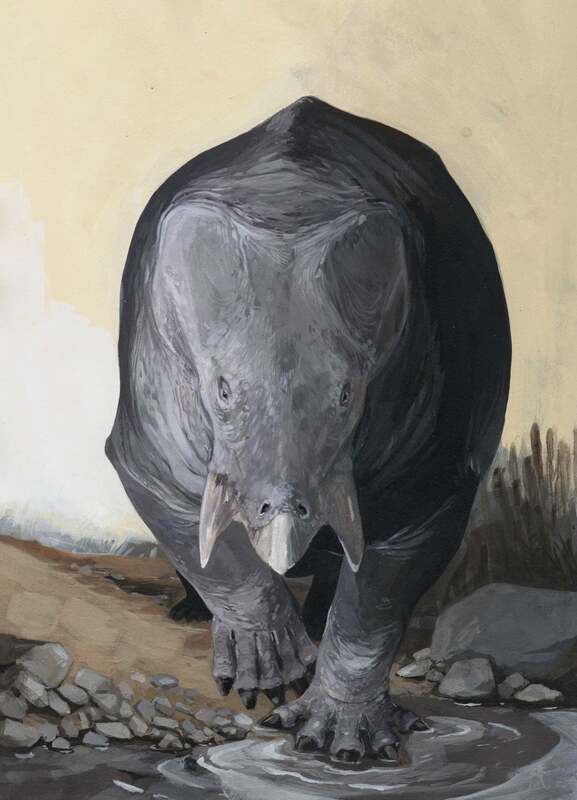 As the discovery of Lisowicia bojani demonstrates, animals other than dinosaurs managed to attain gigantic sizes during this stage of evolutionary history. Lisowicia bojani eventually died out, but for its closely related proto-mammalian relatives, it was a sign of things to come. The remains of an unusually large Lisowicia bojani specimen were uncovered by palaeontologists Tomasz Sulej from the Polish Academy of Sciences and Grzegorz Niedźwiedzki from Uppsala University. The bones were found preserved in siltstone deposits at the Lisowice site in southern Poland. Back in 2008, these researchers started to get an inkling they were dealing with a plus-sized animal after discovering a dicynodont femur bone measuring 56 centimetres (22 inches) in length. This latest skeleton, however, is considerably larger, featuring a femur measuring over 80 centimetres (31 inches) in length. The details of this finding were published last week in Science. Indeed, the discovery of the elephantine Lisowicia bojani—a four-legged creature weighing an estimated 9 tonnes (18,000 pounds)— is rewriting evolutionary history. Dinosaurs, this new research suggests, weren’t the only large animals to romp around the Triassic landscape. To be clear, dicynodonts were not true mammals. As Niedźwiedzki explained, they’re extinct non-mammalian therapsids—a group of synapsids that includes mammals and their ancestors (synapsids are sometimes referred to as proto-mammals or stem mammals). Dicynodonts are a sister line to the mammalian line, but they’re not our direct ancestors. They’re more like our distant cousins, similar to the way monkeys are distant cousins of humans. Fossils of dicynodonts have been uncovered in Africa, Asia, and North and South America. They tend to be on the smaller size, about the size of large dogs, and with sprawling forelimbs that come out from the side, similar to lizards. 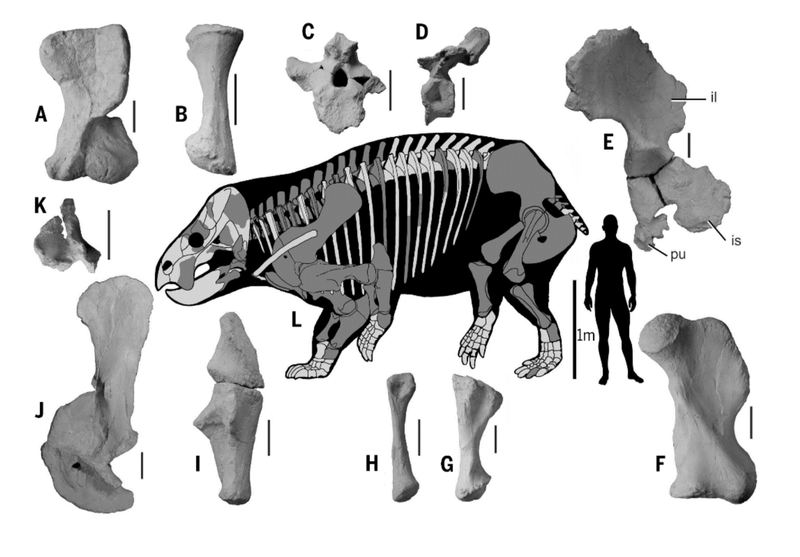 But the dicynodont fossil uncovered in Poland is different—it’s larger, and suggestive of a creature that stood upright on four legs. What’s remarkable about the new discovery, says Brusatte, is that this very old cousin of mammals had evolved similar features—a huge size and column-like limbs held under the body—as true mammals would, albeit many tens of millions of years later. Lisowicia bojani emerged around the same time that long-necked sauropod dinosaurs were developing their supersized bodies—but these dicynodonts reached sizes that mammals themselves wouldn’t attain for another 150 million years. Careful analysis of the Lisowicia bojani fossil suggests it stood 2.6 metres tall (8.5 feet) and measured 4.5 metres (14.8 feet) in length. Its weight, at 18,000 pounds, is a bit heavier than modern elephants. Fossils found alongside the dicynodont, such as plants, amphibians, dinosaurs, and other early relatives of mammals, suggests it lived alongside, and possibly consumed, gymnosperm tree-like plants called Brachyphyllum and a seed fern called Lepidopteris. Its landscape was a relatively flat riverside with sparse vegetation. The researchers also found traces of a dinosaur bearing a distinct resemblance to North America’s Coelophysis—a two-metre-long (six-foot) predatory dinosaur. As for the apex predator of this world, that distinction belongs to Smok, a two-legged, 6-metre-long (20-foot-long) carnivore whose name means "dragon" in Polish. Clearly, the conditions were in place during the Late Triassic for Lisowicia bojani to emerge, but as to why it disappeared, while large dinosaurs lived on, now represents a profound mystery. “The dinosaurs won, dicynodonts went extinct, and tiny synapsids—early mammals—lived for a long time in the shadow of the dinosaurs during the Jurassic and the Cretaceous,” said Niedźwiedzki. Prior to the extinction of the dinosaurs, however, these animals “showed what they should become,” he added. Lisowicia bojani didn’t emerge or disappear overnight, so other fossils, both younger and older, are likely to be discovered. What’s more, the researchers aren’t sure if the new specimen is fully grown, so the discovery of further specimens would help to clear that up.